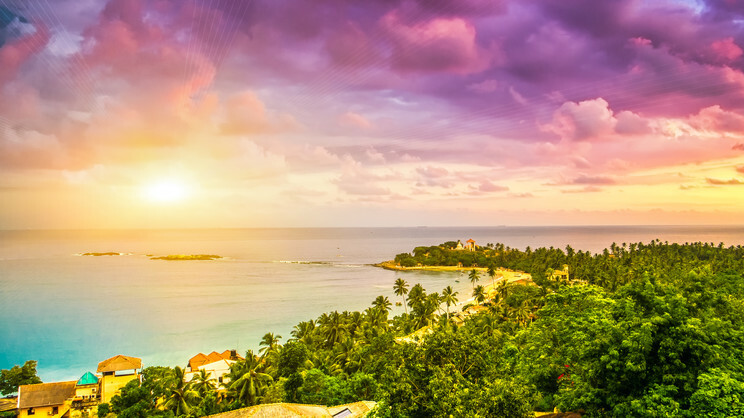 Escape to the enchanting island of Sri Lanka for a sensational 3-star holiday. We’ve put together a number of magnificent luxury resorts and hotels for you to choose from. Enjoy the beauty and tranquillity of Sri Lanka on one of our luxury 4-star holidays. Select a resort that suits you and get set for an unforgettable tropical getaway. Endless beaches, glorious scenery and amazing wildlife make Sri Lanka an enchanting paradise destination. Take a look at our 5-star luxury resorts and start planning your dream holiday today. The small island nation of Sri Lanka packs a whole lot into such a small area. With endless beaches, timeless ruins, fantastic wildlife, exceptional cuisine and fascinating ancient culture, this small nation manages to cram more intrigue and beauty within inside its modest shores than almost anywhere else in the world. The verdant hills are a beautiful juxtaposition to the tropical coasts and lowlands, offering treks and train rides you’ll never forget. With ancient ruins to explore and colourful temples scattered throughout the nation’s inland national parks, there’s a lot more to discover in Sri Lanka than the popular beach resorts and pristine sands. Passport/visa requirements: Your Passport must be valid for a minimum period of 6 months from the date you enter Sri Lanka. You will need a visa to enter Sri Lanka. Tourist visas are normally issued for a maximum of 30 days. Packing essentials: Due to Sri Lanka’s tropical climate, light fabric clothing is your best option. You are also advised to take, sun cream, sunglasses and a sun hat. It’s also worth packing mosquito repellent, as well as light, waterproof walking shoes if you plan to explore the mountains. Sri Lanka is a land rich and varied with sensuous experiences to discover. From brilliant beaches and fascinating ruins to exotic landscapes and mouthwatering food, this wondrous destination has it all in abundance. For such a small nation, Sri Lanka offers a whole range of unique and fascinating experiences exceptional for adventure, cultural discovers, exploring the island’s wonderful wildlife, or simply unwinding on one of the brilliant beaches. This small island nation has it all. 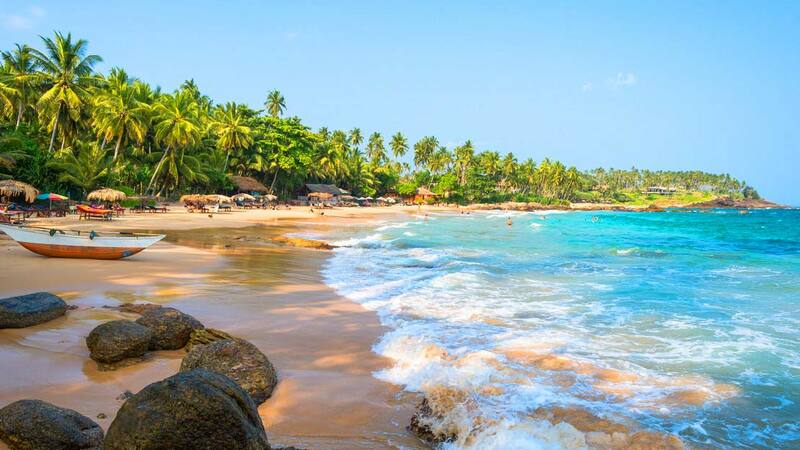 The one thing that Sri Lanka is known for above all else is its dazzling beaches. The south coast, especially, has a host of spectacular white and golden sand beaches that are as beautiful and serene as anywhere in the world. Away from its stunning coastline, Sri Lanka has a whole host of cultural and natural places of interest. The Uda Walawe National Park is a huge chunk of savannah grassland that homes herds of buffalo, crocodiles, sambar deer and Indian elephants. You could also visit the sacred site of Adam’s Peak. This beautiful mountain is a holy site for Buddhists, Hindus, Muslims and Christians and is a brilliant excursion to learn about the mythic history of the place and experience its spectacular view. While on the island it’s an absolute must you sample the local cuisine. An island so rich in spices is sure to offer dishes bursting with flavour. 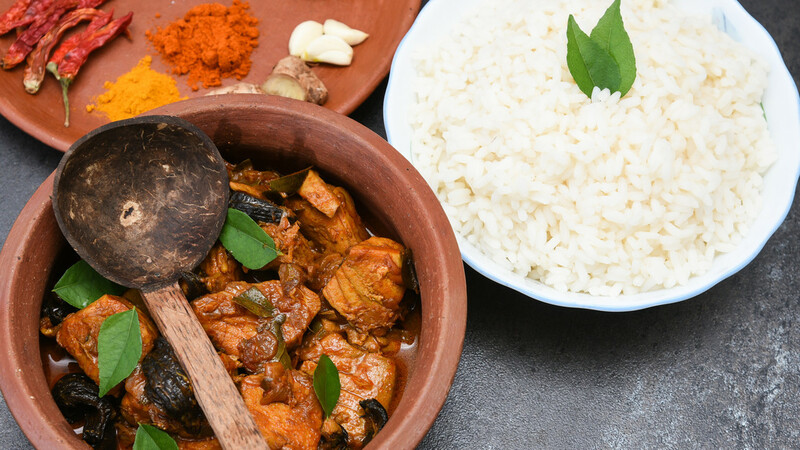 Food is an integral part of the Sri Lankan culture and is something they take tremendous pride in, resulting in uniformly great food throughout the island. 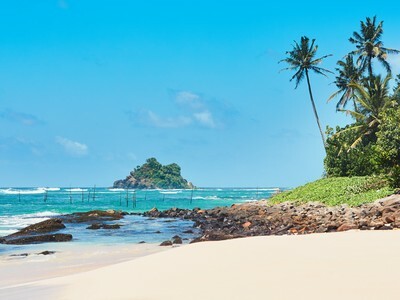 For more information on Sri Lanka holidays, call Destination 2 on 01244 957 714 and speak with one of our friendly and knowledgeable travel experts. The weather in Sri Lanka is tropical with no real marked seasons. Temperature averages hover around the high twenties year round and it is often humid. The higher ground is much cooler, inland. Sri Lanka receives quite a lot of rainfall, which accounts for its lush vegetation and it sees more rain in the northern and eastern regions in December and January. The Yala monsoon season brings rain to the south and west coasts from May to July. Although you may see rain while in Sri Lanka, it often manages to quell the high humidity and the hot temperatures make it less of problem than in more northern regions. You love topping up your tan on beautiful palm-lined beaches or dipping your toes into shimmering warm ocean waters. You are intrigued by ancient ruins, picturesque temples and once-in-a-lifetime adventures. You want to feast on irresistible local cuisine and discover new scents and spices. Sri Lanka has so many superb beaches that you’ll be spoilt for choice when it comes to deciding which breathtaking stretch of shoreline is for you. Whether you’re looking for a secluded sunbathing spot, thrilling water sports or a place to take all the family, you’re sure to find your own piece of paradise on the enchanting island of Sri Lanka. The serene sands of Dickwella Beach are ideal for undisturbed moments of relaxation, or how about whiling away the hours on the sleepy shores of Uppuveli? Water sports are extremely popular in Sri Lanka. This is certainly the case at the picture-perfect Arugam Bay on the island’s east coast, where you’ll find plenty of surfers. 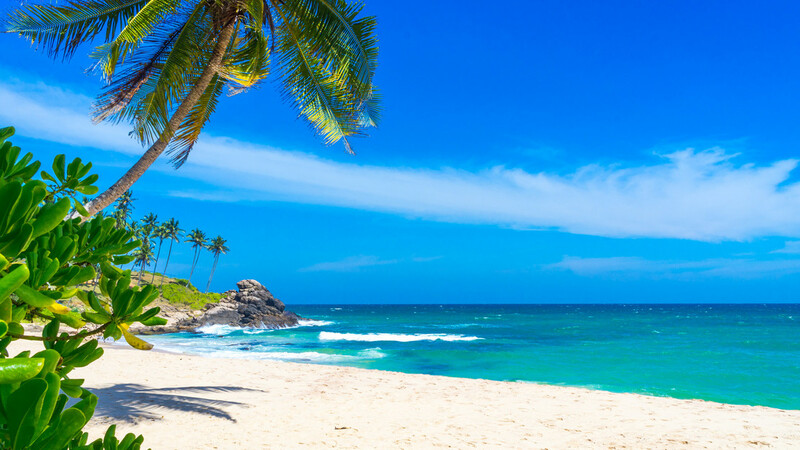 Alternatively, you can enjoy whale watching off the idyllic sands and shallow waters of Bentota Beach or the intimate palm tree-lined Mirissa Beach, where there are an array of superb bars and restaurants close at hand. Sri Lanka is also a great destination for spotting sea turtles, with the waters off Unawatuna Beach, in the Galle district, a superb place to see these incredible creatures. Scuba diving and snorkeling are also popular here, as well as at Polhena, which is renowned throughout Sri Lanka for its colourful coral reefs and abundance of aquatic life. Thai Pongal is a Hindu harvest festival on the first day of Thai; the tenth month in the Tamil calendar. It is a day when Tamil people give thanks to the sun and the cattle for a big crop. As part of the festivities, families gather for the ceremonial cooking of Pongal (rice pudding), which is eaten and shared with neighbours after prays said to thank the nature spirit, the sun and farmers. Independence Day in Sri Lanka is celebrated annually on February 4, having gained independence from Britain in 1948. The occasion is marked with dances, military parades and games, as well as a two-minute silence in memory of national heroes. In the capital city, Colombo, the president raises the country’s flag and gives a speech that people can watch live on TV. Held on the day of the full moon in February, Nawam Maha Perahera is one of the most important religious and cultural events in Sri Lanka. Known for being the day that the first chief disciples of the Buddha were appointed, locals celebrate with a cacophony of colour, music and vibrancy, as well as being treated to a hundred-strong parade of elephants decorated in true Sri Lankan style. Sri Lankan New Year falls in April and is a huge cause of celebration for the whole country. Families come together to exchange presents and feast on Kiribath; rice cooked with milk. In the evenings though, the party really starts and young and old take part in fun-filled street parties involving music, dancing and feasting. Vesak is the day that Sri Lankans come together to honour the three days that Buddha was born, became enlightened and passed away. Celebrated in May or early June, colourful lanterns are lit in front of houses all across the island. After all, the literal translation of Vesak is the Festival of Light. Poson Poya is celebrated on the day of the full moon in June and is noteworthy to the island because it’s the day that Sri Lanka was first introduced to Buddhism in 3BC. On this day, many people flock to Anuradhapura, the ancient capital city of the country, as it was here that Buddhism started. White-robed devotees also climb to the summit of Mihintale to see the setting where meetings to convert to Buddhism first took place. Vel is one of Sri Lanka’s most prominent Hindu festivals. Held in Colombo every July or August, it’s a celebration of the trident (vel) that the Hindu war God, Skanda, once owned, to fight evil. Every year, the vel is placed in a grand temple chariot and pulled over the course of the whole day by hundreds of devotees dressed in white and covered with holy ash. Ramadan is the ninth month in the Islamic calendar and is the time when Muslims believe that God (Allah) first revealed the Koran (the Islamic holy book) to the Prophet Muhammad. Muslims observe Ramadan by fasting during daylight hours. Eid al Fitr marks the end of Ramadan, with Muslims celebrating by decorating homes, exchanging gifts and holding a big feast. Hajj Festival or Eid-al-Adha is the feast of sacrifice and celebrated by Muslims all over Sri Lanka. Marking the day that Ibrahim gave up his son Ishmael to Allah, Sri Lankans celebrate with a morning sermon at the mosque and a donation to the poor and needy, before dressing up and enjoying the day with friends and family. Diwali or Deepavali is perhaps one of the most important Hindu celebrations. Held every year around the months of October or November, this special festival of the lights marks the victory of good over evil and sees the lighting of oil lamps, the burning of firecrackers and the exchanging of gifts between friends and family. You can’t visit Sri Lanka without sampling the irresistible local cuisine. The dishes served up across this incredible Indian Ocean island have been shaped by many factors, including history and culture, with influences from Indonesian, Dutch and South and Southeast Asian cuisine. One of the main components of Sri Lankan cuisine is rice. Either boiled or steamed, it is served with a variety of different curries with something to suit all tastes. Fish ambul hiyal is a peppery tuna curry created using a blend of spices, including dried goraka which gives the dish a sour flavor. Other popular curries include kukul mas curry, a marinated chicken concoction, and parippu, a dhal curry which incorporates red lentils in coconut milk and fresh green chillies. If you’re on a health kick while on your travels, a tasty mallung could be right up your street. Made using chopped greens, chillies, lemon juice, shallots, ginger, grated coconut, salt and pepper, this delicious salad is loaded with vitamins, carbohydrates and protein and provides a tasty alternative to curry. For a quick and easy snack while exploring the famous Sri Lankan landmarks, a kottu roti is the perfect go-to dish. Resembling a stir-fry, you can watch street food vendors mix shredded roti bread with an assortment of vegetables, meat, soya sauce, ginger, garlic and other secret spices to create this tasty treat. With all of this and more on the menu, you’re sure to enjoy an array of delicious delights during a sensational holiday in Sri Lanka. If you’re looking for a holiday full of history, culture and sensational scenery, then Sri Lanka is certainly the place for you. A dream destination for loved-up couples, eager explorers or for adventurous families, there’s a whole raft of experiences ready and waiting to be enjoyed on this paradise island. 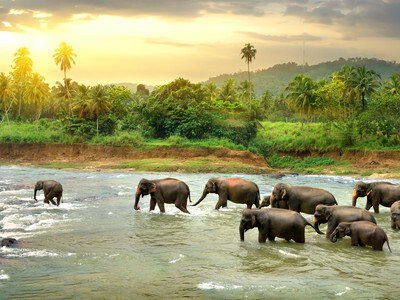 From picturesque mountains and lush forests, to golden beaches and breathtaking waterfalls, Sri Lanka is a destination packed full of enchanting landscapes and fascinating wildlife. And what better way to get closer to nature, than by heading out to explore one of Sri Lanka’s phenomenal national park. Arguably the most famous is Yala National Park, located in the south east of the island. As well as being home to the endangered Sri Lankan leopard, you’ll also have a high chance of seeing sloth bears if you visit in the summer months, while a stunning array of rare birds can be spotted all year round. If larger mammals are more your thing, then you can’t get much bigger than the Indian elephant. One of the best places to see them is in Udawalawe National Park, where more than 500 roam the rolling grassland. Another option for sightseeing is Horton Plains National Park. If you’re expecting to see hordes of animals then you’ll likely leave disappointed. Fear not, however, as Horton Plains offers some of Sri Lanka’s most breathtaking views, especially when you reach the end of the plateau and come to the 4,000 feet drop that is aptly named World’s End. With plenty of other national parks to explore, you’re sure to be left completely captivated by the phenomenal scenery and wildlife waiting to be discover during an incredible holiday in Sri Lanka. A combination of European flair and an intriguing local heritage help to give the port city of Galle a real continental feel and make it one of the most captivating destinations in Sri Lanka. For a unique view over the city or out to sea, you should head to the Galle Fort, built by the Portuguese in 1588. Looking to combine some sporting action with the heritage site? You’ll find a cricket ground in the background which is surrounded on two sides by the Indian Ocean – Howzat?! Anther heritage site you can’t miss is the Golden Temple of Dambulla, a centuries old sacred pilgrimage with 153 Buddhist statues. On entering the temple you’ll be greeted by a giant Golden Buddha, and as you head further inside you’ll be simply mesmerised by the 80+ caves, each impressively decorated. Dambulla is bang in the middle of Sri Lanka, so it is within easy driving distance from both Colombo and Kandy. It is also close to the spectacular ancient fortress of Sigiriya. Dubbed ‘Lion Rock’ due to its sheer size and the fact that its entrance is between two huge rock carvings which resemble a lion’s paws, this 200m high natural structure should be on everyone’s bucket list. The pristine and relatively flat green surroundings only enhance the sheer size and height of this mammoth beauty. It features a citadel on top, built by King Kasyapa to protect himself from attacks by his brother Moggallana, who was the rightful heir to the throne. It’s unsurprisingly a UNESCO World Heritage Site, but will you dare to climb the 1,200 steps to the top? We think it’ll be worth the effort! For those seeking a heritage site that offers a little more extravagance, then the Royal City of Kandy is a must see. The UNESCO status is thanks to The Temple of The Tooth, with its simply stunning location in the royal palace complex making it as jaw-dropping as it is beautiful. It was previously the former Kingdom of Kandy before several European nations tried and succeeded to conquer it, as well as being the last capital city of independent Sri Lanka. Other popular heritage sites include Polonnaruwa, which was once the capital city of Sri Lanka and still features temples from that time, such as the mesmerising Gal Vihara and Hatadage. Likewise, Anuradhapura has several holy places still in use, including the stunning Ruwanweliseya and the nearby mountain peak of Mihintale; which according to legend was the meeting place for the start of Buddhism. Without doubt, one of the cheapest and best ways to see the true heart of Sri Lanka is via the railway system – no route more apt than Ella to Kandy (or vice versa). Considered one of the most beautiful train journeys not only in Asia but in the world, it also comes with a surprisingly affordable ticket price. Along the route you’ll pass miles and miles of spectacular natural scenery and get a taste of what life in Sri Lanka is really like, away from the hustle and bustle of the cities. It takes around seven hours, but with views like these, you won’t want to miss a single second! Another big draw for visitors to Sri Lanka is its tea plantations, with the country being the world’s fourth largest tea producer. There are a number of plantations open to visitors, while you can discover more about Sri Lanka’s rich tea heritage at the Ceylon Tea Museum, at Hantane. Why book a holiday to Sri Lanka with Destination2? Here at Destination2, we offer a wide range of luxury Sri Lanka hotels and resorts for you to choose from. We are passionate about offering value for money and work hard to bring you the very best prices on holidays to Sri Lanka. 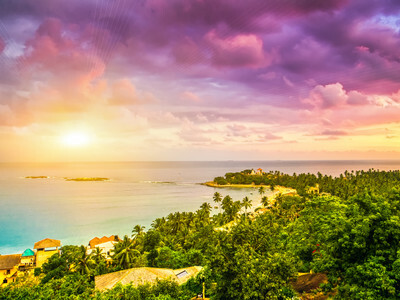 Our dedicated Indian Ocean specialists have a wealth of knowledge regarding travel to Sri Lanka and strive to unearth incredible deals to help make your holidays come true.